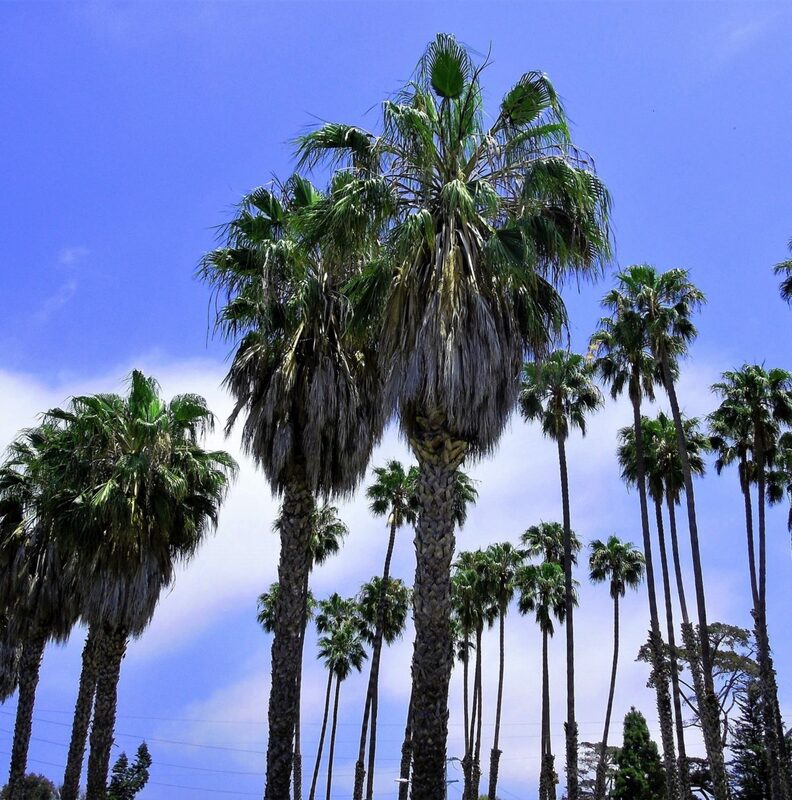 The Mexican Fan Palm, a most iconic “skyline” tree, is also the most common palm in the beach areas of Santa Barbara. A native of the canyons of Sonora and Baja Mexico, it is now common throughout Southern California and has become associated with the image of sun-drenched coastal communities, including Santa Barbara. 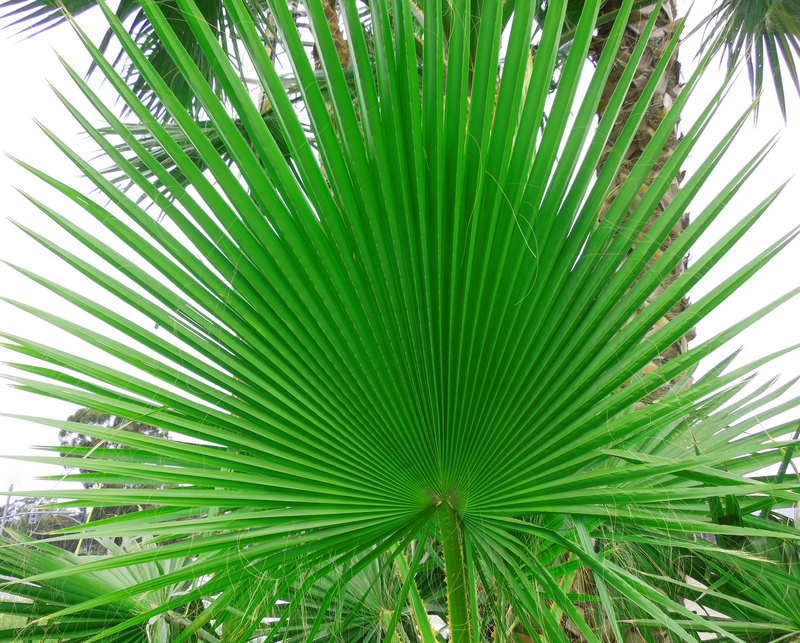 Its common name describes its homeland and its glossy green fronds, which are shaped (somewhat) like the human palm, scientifically “palmate”, but more truly resemble a 4-foot long and 3-foot wide pleated paper fan. Its botanical name is Washingtonia robusta. The genus name, Washingtonia, honors our first president, George Washington; the specific epithet, robusta, is from Latin and means hardy and strong. When the Mexican Fan Palm is young, its trunk is slowly covered with depleted dried fronds, which gardeners usually trim off, leaving the frond bases hugging the trunk in an attractive basket-weave pattern. Untrimmed, a young palm retains these dried fronds, which then accumulate against the trunk to form a thick thatch called a “skirt”. Dried fronds should be trimmed, because otherwise they can be a fire hazard and do become home to rats! When trimming, it is best to remove only the brown and yellowing fronds and to leave the green fronds intact, so they can continue to provide the palm with photosynthesized plant sugars. When working with these fronds, beware, each has a 3-foot stem (or petiole) which is armed on the margins with stout, recurved spines, ½ to ¾ inch long, that can leave nasty scratches. In an older and taller palm, the fronds in the higher trunk area may be entirely whipped off by high winds. As the palm ages, its trunk, 8 to 12 inches in diameter, turns a soft gray color and bears rings of frond scars. An older palm can develop a bulge at the foot of the trunk, where exposed, adventitious roots may grow out seeking water. The black, ovoid-shaped, fruits, called “drupes”, with one seed in each, are ¼ to ½ inch long. Propagation by seed, which will germinate within 2-3 months, is fairly easy. A Mexican Fan Palm can grow to over 100 feet tall, adding 2 to 3 feet per year when young and slowing to about 1 foot or less per year near maturity. Research on native stands shows that they can live up to 500 years. This lovely palm is hardy and extremely drought tolerant when established – and can grow in almost any soil, including sand. It does best in bright sunny conditions, but will tolerate some shade. Because of its ultimate height, it should not be planted in a confined area or under power lines. It is cold-hardy to 20 degrees for short time periods, but foliage can be damaged at that temperature. It is also very drought tolerant when established. They are frequently planted in clusters of two or more, to create a fuller canopy and a more tropical look. They are also planted singularly, in long rows, for a stately formal effect. Mature Mexican Fan Palms can be seen all around town: on Cabrillo Boulevard (along the sand, westward from the Bird Refuge, through East Beach, through Chase Palm Park, and on to Leadbetter Beach), up along Shoreline Drive to Shoreline Park, and in the downtown State Street Mall plantings. Some of the oldest and tallest ones in the City, at well over 100 years old, can be seen in the 1100 and 1200 blocks of Quinientos Street and the 700 block of Anacapa Street.